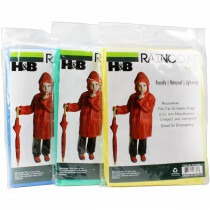 No need to brave the rain without a rain coat and no need to put on an expensive bulky slicker. 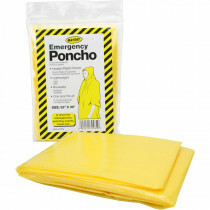 Our Rain ponchos and gear with hoods are designed to protect you from the rain and also be highly visible for your safety and others. The Polyethylene fabric makes our rain gear very light weight and flexible so they are easy/convenient to carry and take up very little storage space. 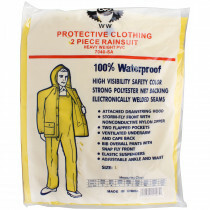 Protection from the rain doesn't need to be costly! 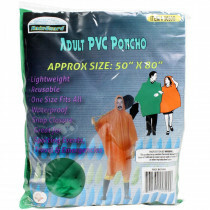 The poncho has been around for centuries but the regular use of the rain ponchos, as we know them, was after the Civil War when the US Army issued ponchos of waterproof rubberized canvas to its forces during the Spanish-American War of 1898. 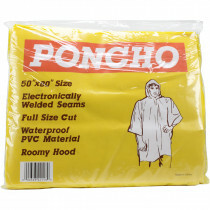 It was preferred over the raincoat for its ability to keep both the wearer and his pack dry, as well as serving as a roof for a makeshift shelter.